Carington Bowles. "How d'ye like me" [A Macaroni]. 1772. Yankee Doodle went to town A-riding on a pony, Stuck a feather in his cap And called it macaroni. When “Yankee Doodle” became a popular tune in the late eighteenth century, to call someone a “macaroni” was to connect them to a satirical type -- typically a male overly concerned with continental fashions and foreign art. Quite often, portrayals presented the macaroni as a feminized character who adopted the manners of the French and the Italians – and some suggested that the individual partook in sexual acts with other men. Thus, as an identity that defied the dominant middle class ideals of a rational, moderate, and heterosexual British masculinity, by the 1770s, the term “macaroni” was one of derision. 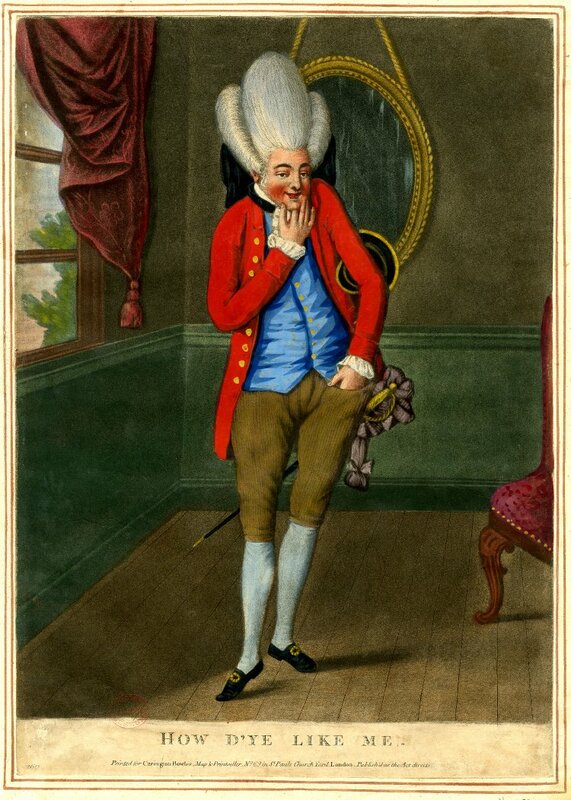 For British soldiers in the American colonies, Yankee Doodles who pretended to be cosmopolitan by mimicking continental fashions were not only macaroni, but they were provincial macaroni -- so disconnected from European tastes that they imagined a feather in their cap was à la mode. “Macaroni” was one of a cluster of anglicized Italian nouns (e.g. dilettante) that became hardened into terms of derision over the course of the eighteenth century. Its etymology, however, demonstrates that while not necessarily a term of high praise, it was not always a word of condemnation. In fact, it could be a compliment in certain contexts. Among friends, “macaroni” could be a friendly jest, or prosocial teasing, as was the case when James Boswell called Samuel Johnson a macaroni for his horsemanship. François Rabelais made frequent use of the form, and a popular English example from 1691 was William Drummond’s Polemo-Middiana. Both the printed and manuscript literature of eighteenth-century Britain reveals the form’s continued popularity. In fact, macaronics were often found in letters of Grand Tourists, composed along with ribald verse, and they were intimately connected to the social world of continental travel. The key to the Macaronic form was its blending of languages and literary techniques into a new genre. Eighteenth-century commentators even noted that “Makarons,” a form of gnocchi popular in Italy, were like macaronics, composed of a variety of ingredients. In this sense, the form had much in common with the Macaroni of mid-century. Their style was an international mélange of fashions and manners, which, like macaronic verse did not fit into easily identifiable categories. As such, their existence was a challenge to dominant modes of social performance and cultural expectations. On the “macaroni” in eighteenth-century Britain, see Cindy McCreery, The Satirical Gaze: Prints of Women in Late Eighteenth-Century England, Oxford Historical Monographs (Oxford: Clarendon Press, 2004); Peter McNeil, “‘That Doubtful Gender’: Macaroni Dress and Male Sexualities,” Fashion Theory 3, no. 4 (1999): 411–47; Peter McNeil, “Macaroni Masculinities,” Fashion Theory 4 (2000): 373–404; Miles Ogborn, Spaces of Modernity: London’s Geographies, 1680-1780 (New York: Guilford Press, 1998); Amelia F. Rauser, “Hair, Authenticity, and the Self-Made Macaroni,” Eighteenth-Century Studies 38, no. 1 (2004): 101–18; Shearer West, “The Darly Macaroni Prints and the Politics Of ‘private Man,’” Eighteenth-Century Life 25, no. 2 (2001): 170–84. Professor Linda Colley, Britons: Forging the Nation 1707-1837 (Yale University Press, 1994); Douglas Fordham, British Art and the Seven Years’ War: Allegiance and Autonomy (Philadelphia: University of Pennsylvania Press, 2010); Holger Hoock, Empires of the Imagination: Politics, War, and the Arts in the British World, 1750–1850 (Profile Books, 2010). Frances Kemble to Harriet St, Leger, 15 December 1845, in Records of Later Life, vol. 3, 2nd ed. (London, 1882), 110. James Boswell, The journal of a tour to the Hebrides, with Samuel Johnson (Dublin, 1785), 84. Ephraim Chambers, “Macaroni,” Cyclopædia: or, an universal dictionary of arts and sciences 2 (1728), 478. Joseph Addison, The Spectator, no 47 (24 April 1711). James Appleton Morgan, Macaronic Poetry (New York, 1872), 167-68.